For some, teaching is a fairly intuitive act. But thanks to research from the fields of education, psychology, and elsewhere, we know a lot about how learning works. That understanding can (and should) inform our teaching. To illustrate the connection between research on learning and the teaching practices we employ, I’m running a series of posts here on the blog on the teaching of board games, a content domain outside the usual academic disciplines. Hopefully, this series will provide you with a few ideas for teaching whatever you teach. And for readers who, like me, find themselves teaching a lot of board games, this series should be particularly fun. 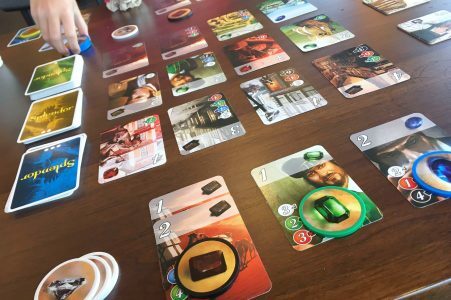 In part one of the series, I discussed teaching board games in ways that leverage learners’ existing mental models of how the world works. In today’s post, I’ll explore a second key principle of learning: the ways that learners organize knowledge affect how they remember and use that knowledge. Novices in a particular domain tend to have little bits of disconnected information rattling around their heads, an example here, a formula there. Experts, on the other hand, tend to have robust knowledge organizations, with lots of connections and structures that reflect the relationships between ideas and examples. This helps the expert recall information quickly, make sense of new information, and marshal what they know to solve problems. What does this imply for teaching? We should do what we can to help our learners develop robust and useful knowledge organizations. That means helping them see the big picture and how individual facts and examples and procedures fit into that big picture. 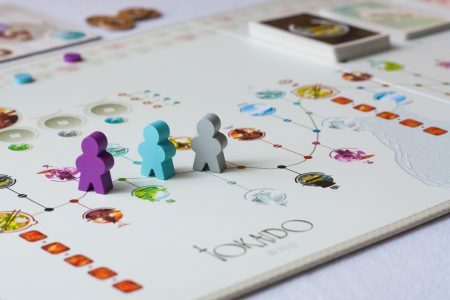 Take a game like Tokaido, one of my favorites, a game I describe as “competitive vacationing.” In the game, players take on the role of travelers in 17th century Japan making their way along Tokaido, the road that connected Kyoto to Edo. The game board for Tokaido provides the big picture for players. Kyoto is at one end, Edo is at the other, and the various actions players can take are arrayed in between as stops on a path. The journey from one of the board to the other is the central organizing principle of the game, and it’s reflected in both the theme of the game and the graphic design of the board. I can convey that organizing principle very easily to new players, then relate the mechanics of the game — movement, action spaces, set collection — to that principle, both thematically and visually. The visual layout of a game can be useful in teaching other games that aren’t quite so thematic. For instance, in the game Splendor, a player can take a few colored chips from a common pool, or spend their chips to purchase cards from a tableau. Some cards are worth victory points, and the first player to 15 points wins. All cards, however, have a color and can be used as reusable chips, meaning that as you grow your card collection, your buying power increases, allowing you to purchase higher point value cards. There’s not much story to the game, but the cards available for purchase are displayed in three rows, each row more costly (and more rewarding) than the one below it. This arrangement helps explain how a player’s buying power increases, and once players understand this basic structure, they can pick up the other rules they need to know and play competitively. Another way to provide the big picture when teaching a board game is to show players what the end of the game will look like. I use this tactic when I teach Mysterium, a cooperative whodunit with a strong visual element. Players work together to solve a murder, with one player acting as the ghost, who knows who did it. Before I explain how the first few rounds of the game go, I’ll show new players what the last round should look like, assuming we work well together to get there. In the last round, each player (other than the ghost) should have a set of three cards in front of them: a person, a place, and a potential murder weapon. It will be our job to interpret the ghost’s clues to figure out which of those triples represents the actual killer. There’s a lot more to the game, but starting with the end in mind provides clarity and purpose to the rest of the game’s mechanics. 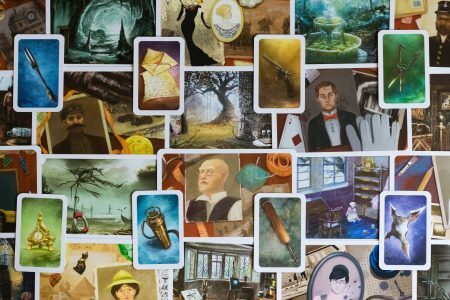 I’ve tried teaching Mysterium start-to-finish, but I’ve found that teaching it finish-to-start gives players a better sense of why the first rounds work the way they do. What implications for teaching in other contexts can we draw from these examples? Tell a story. If there’s a narrative or central metaphor that explains a course or a unit, share it with students. Once they have that main idea, they can more easily understand and remember the details that go with it. Draw a map. Whether that’s a graphic syllabus, a concept map, a timeline, or something else, provide students a visual representation of the main ideas in a course and how they relate. This goes a long way toward building their knowledge organizations. Spoil the ending. At the start of a unit, show students an interesting problem or case study that they’re not yet ready to handle. This will provide a sense of purpose to the learning that follows, as they learn what they need to tackle that interesting challenge. More on teaching board games in future posts. In the meantime, if you’d like to see other modern board games in action, check out my @firstplayertoken Instagram account. Board games have such strong graphic design these days, they’re a lot of fun to photograph. That makes Instagram a great community for sharing game experiences. And while this series is on the teaching of board games, if you’re interested in teaching with board games, I suggest you check out this Inverse Genius podcast episode with J.S. Bragg and Bethany MacMillan, who teach leadership at Miami University through board games. 3 Responses to "Teaching Board Games #2: The Big Picture"